Look, if I’m going to talk to the frontman of the upcoming Batman: Arkham Knight game, Dax Ginn, I’m going to do it properly. And by properly I mean get sweaty in a cowl and start geeking out because I threw my objective opinion off a balcony the second I started playing that game. And that’s just what happened at E3, as I suited up for an interview with the Rocksteady Brand Marketing Producer behind the scenes. Check it out! “Well that’s the critical thing, ever since we started on Arkham Asylum our focus was on making a game that makes people feel like being Batman,” Ginn said. 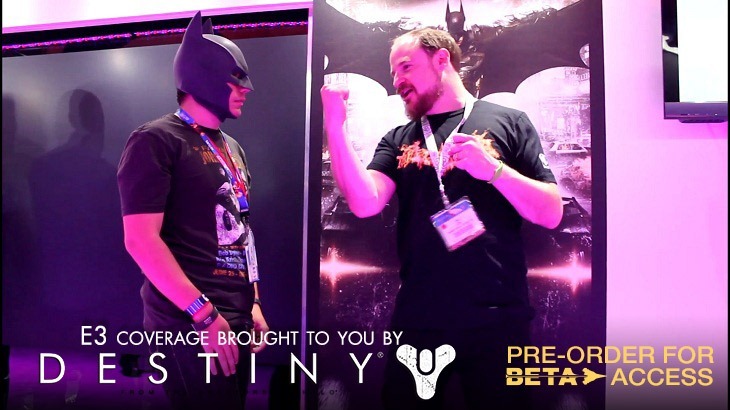 It was about making a game that makes you feel like a deeper sensation of being Batman. So you can uppercut a guy into the air and the Batmobile will take him out with the riot suppressor, so really double-teaming Batman with the Batmobile gives him that edge of man and machine. “We’ve always had villains in Batman’s world who challenged him in very particular ways,” Ginn said of the new mystery villain who bears a grudge against the dark knight. What we’ve never had in our games is someone who can challenge Batman in a physical fist-fight and be Batman’s equal and that’s what the Arkham Knight is. He’s a combatant who is the equal of Batman when it comes to combat and gadgetry. On top of that, he’s a commander of a vast military force so he really brings a double-threat to Batman and Gotham City. As for that delay, Ginn explained to me that there’s a very simple reason for the slip into 2015. “ Awesome takes time”. Quality is critical to us, and that was the realisation that we were looking at with the size and the scale of the game that we had made. And it’s epic. It’s a massive massive game and all of the features that we’ve designed and wanted to put into it, we were then faced faced with that challenge of, do we want to cut those features out, or do we want to give ourselves a bit more time and make the game that we want to make. Awesome takes time, and this game is shaping up to be pretty awesome. We’re talking 2015 for the release of Batman: Arkham Knight and I think gamers are really going to see where we spent our time on it. I’ve played the game, I’ve loved it more than Eskom loves your money and it’s a massive step forward for the franchise. I can wait until 2015. Impatiently yes, but I can wait. Next article Can Microsoft stop the PlayStation 4 train?